Today, Dassault Falcon and Jeppesen signed an agreement to develop new performance software and services to be incorporated into the Electronic Flight Bags (EFB) in the Falcon family of business jets. Thanks to this new software, take off and landing calculations will be easily performed during mission preparation by the flight crew. 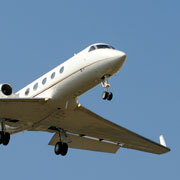 The software runs on any PC or EFB featuring the Windows operating system. Dassault will be responsible for updated performance information, computation modules and performance data. Jeppesen will provide and update airport, runway information and obstacles.“This Dassault/Jeppesen partnership will give Falcon customers the benefit of precise performance information for each take off and landing and will significantly decrease crew workload during mission preparation,” said Jean-Paul Pellissier of Dassault Aviation. These new tools and services will be available as an option to new and existing Falcon customers at the end of next year. Since the rollout of the first Falcon 20 in 1963, over 1,650 Falcon jets have been delivered to more than 65 countries worldwide. The family of Falcon jets currently in production includes the tri-jets - the Falcon 50EX, 900DX, 900EX EASy, and the new 7X - as well as the twin-engine Falcon 2000, and 2000EX EASy.